"Doctorwine" has rated the wine "Marchesi Antinori Tenuta Guado al Tasso Il Bruciato Bolgheri, Tuscany, Italy" from the vintage 2009 on 29.03.2012 with 80 of 100 points.
" To paraphrase an old advertisement one could day: 'Antinori means quality'. And this would be nothing more than the absolute truth, as made evident by this wine that is not top shelf, not heralded and yet not classifiable simply as a minor wine. 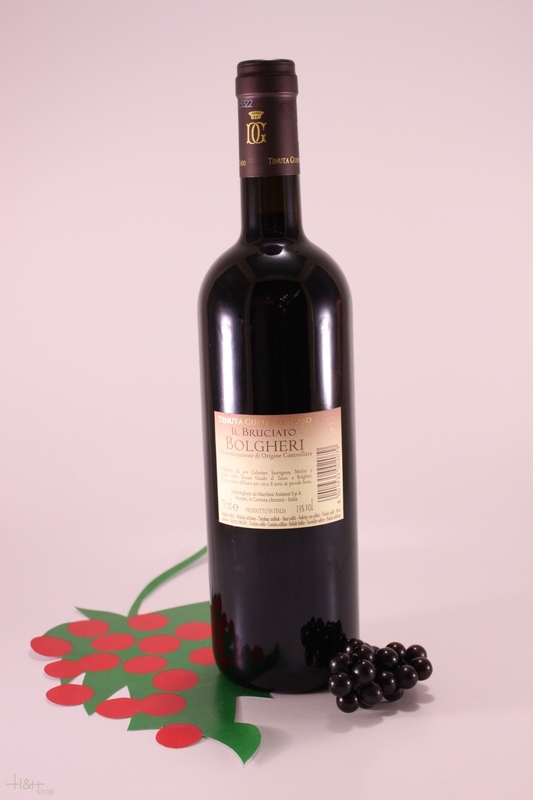 A blend of international grapes and the product of reliable techniques and wine-making skill. This wine is very enjoyable, a true Bolgheri to the last DR0P, perfect and balanced, as is often the case for certain Tuscans. For sure a little more depth and complexity would not have hurt, but at this price who could ask for more. " "Wine & Spirits Magazine" has rated the wine "Marchesi Antinori Tenuta Guado al Tasso Il Bruciato Bolgheri, Tuscany, Italy" from the vintage 2015 on 01.04.2017 with 88 of 100 points. "Wine Spectator" has rated the wine "Marchesi Antinori Tenuta Guado al Tasso Il Bruciato Bolgheri, Tuscany, Italy" from the vintage 2014 on 30.09.2016 with 89 of 100 points. "Vinous Antonio Galloni" has rated the wine "Marchesi Antinori Tenuta Guado al Tasso Il Bruciato Bolgheri, Tuscany, Italy" from the vintage 2013 on 01.10.2015 with 88 of 100 points. "Wine Enthusiast" has rated the wine "Marchesi Antinori Tenuta Guado al Tasso Il Bruciato Bolgheri, Tuscany, Italy" from the vintage 2013 on 05.01.2015 with 90 of 100 points. "Wine Spectator" has rated the wine "Marchesi Antinori Tenuta Guado al Tasso Il Bruciato Bolgheri, Tuscany, Italy" from the vintage 2012 on 31.08.2014 with 91 of 100 points. "Wine Enthusiast" has rated the wine "Marchesi Antinori Tenuta Guado al Tasso Il Bruciato Bolgheri, Tuscany, Italy" from the vintage 2012 on 06.01.2014 with 89 of 100 points. "Wine Spectator" has rated the wine "Marchesi Antinori Tenuta Guado al Tasso Il Bruciato Bolgheri, Tuscany, Italy" from the vintage 2011 on 15.10.2013 with 90 of 100 points. 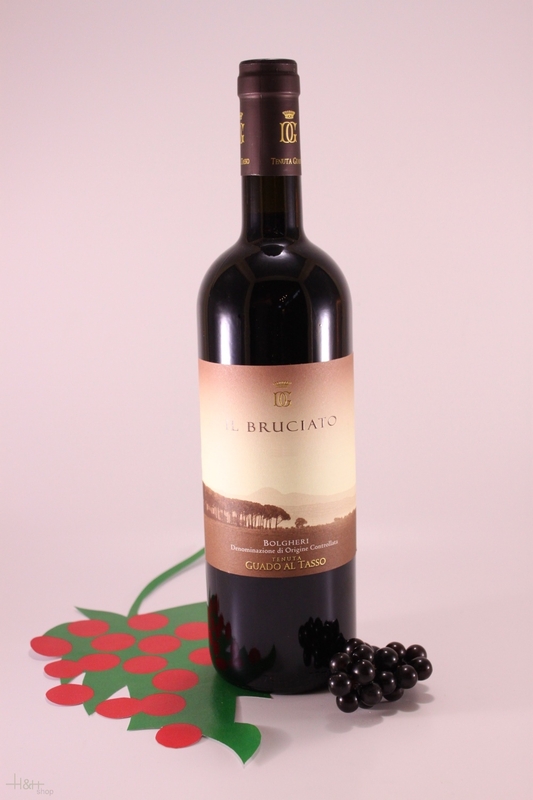 "Wine & Spirits Magazine" has rated the wine "Marchesi Antinori Tenuta Guado al Tasso Il Bruciato Bolgheri, Tuscany, Italy" from the vintage 2010 on 01.04.2013 with 94 of 100 points. "Wine Enthusiast" has rated the wine "Marchesi Antinori Tenuta Guado al Tasso Il Bruciato Bolgheri, Tuscany, Italy" from the vintage 2010 on 04.01.2013 with 91 of 100 points. "Vinous Antonio Galloni" has rated the wine "Marchesi Antinori Tenuta Guado al Tasso Il Bruciato Bolgheri, Tuscany, Italy" from the vintage 2010 on 01.06.2012 with 89 of 100 points. "Wine Enthusiast" has rated the wine "Marchesi Antinori Tenuta Guado al Tasso Il Bruciato Bolgheri, Tuscany, Italy" from the vintage 2009 on 02.01.2012 with 89 of 100 points. "Wine Spectator" has rated the wine "Marchesi Antinori Tenuta Guado al Tasso Il Bruciato Bolgheri, Tuscany, Italy" from the vintage 2008 on 31.08.2010 with 88 of 100 points. "Wine Spectator" has rated the wine "Marchesi Antinori Tenuta Guado al Tasso Il Bruciato Bolgheri, Tuscany, Italy" from the vintage 2007 on 31.10.2009 with 88 of 100 points. "Wine Enthusiast" has rated the wine "Marchesi Antinori Tenuta Guado al Tasso Il Bruciato Bolgheri, Tuscany, Italy" from the vintage 2007 on 11.01.2009 with 89 of 100 points. "Wine Spectator" has rated the wine "Marchesi Antinori Tenuta Guado al Tasso Il Bruciato Bolgheri, Tuscany, Italy" from the vintage 2006 on 15.10.2008 with 90 of 100 points. "Vinous Antonio Galloni" has rated the wine "Marchesi Antinori Tenuta Guado al Tasso Il Bruciato Bolgheri, Tuscany, Italy" from the vintage 2006 on 01.06.2008 with 88 of 100 points. "Vinum Wine Magazine" has rated the wine "Marchesi Antinori Tenuta Guado al Tasso Il Bruciato Bolgheri, Tuscany, Italy" from the vintage 2004 on 01.03.2007 with 15 of 20 points. "Falstaff Magazin" has rated the wine "Marchesi Antinori Tenuta Guado al Tasso Il Bruciato Bolgheri, Tuscany, Italy" from the vintage 2004 on 01.09.2006 with 89 of 100 points. "Wine Spectator" has rated the wine "Marchesi Antinori Tenuta Guado al Tasso Il Bruciato Bolgheri, Tuscany, Italy" from the vintage 2002 on 31.10.2005 with 87 of 100 points. "Wine Enthusiast" has rated the wine "Marchesi Antinori Tenuta Guado al Tasso Il Bruciato Bolgheri, Tuscany, Italy" from the vintage 2008 with 91 of 100 points.